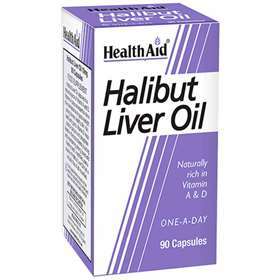 Health Aid Halibut Liver Oil provides a natural, rich source of Vitamin A and D.
Vitamin A contributes in the maintenance of healthy eyes, skin, hair, mucous membrane, good vision and normal growth in children. Vitamin D helps in the normal absorption and use of calcium and phosporus which contributes to the maintenance of normal bones and muscle function. A rich, natural source of Vitamin A and D.
Helps support healthy eyes, skin, hair and mucous membrane. Contributes to good vision and normal growth in children. Free from yeast, gluten, wheat, dairy, sugar, salt, artificial colours, preservative, and flavourings. Suitable for adults and children over 12 years old. Take one tablets daily. This product contains Vitamin A, do not take if pregnant or likely to become pregnant do not unless otherwise adviced by a doctor or ante-natal clinic. Bulking Agent (soybean oil), Capsule Shell agent (gelatine), humectant (glycerol, purified water), Halibut Liver Oil, Vitamin A, Vitamin D.